As a new year quickly approaches, and I attempt to breathe some new life into The Voice of Sport (it’s been a little neglected since I became a dad two years ago), I can’t help but look back as I look forward. For instance, it is hard to believe that it was almost 6 years ago that I sent an email off to the Hershey Bears with an interview request for their captain, Bryan Helmer. A lot has changed since then! Since that first interview, Bryan and his wife Pam have become great friends to my wife Dianne and myself. So has Pam’s sister Kary and her husband Matt Carkner. And it is their perseverance, passion, dedication to the game and more importantly, dedication to their family, which has inspired me to continue with my passion for writing and for creating music too. To be quite honest, I know I’m a better person because I have these wonderful people as my friends. Which brings me to today’s topic – meet two of my heroes! While it was many months ago, it seems like it was only yesterday that Pam and Kary sent me an email asking if I could help them with a project they hoped to pursue… It was a small step towards the many big entrepreneurial steps that would soon follow! So, it was with a tear in my eye that I first read the recently published Hero’s Ho Ho Ho Hockey Dream. 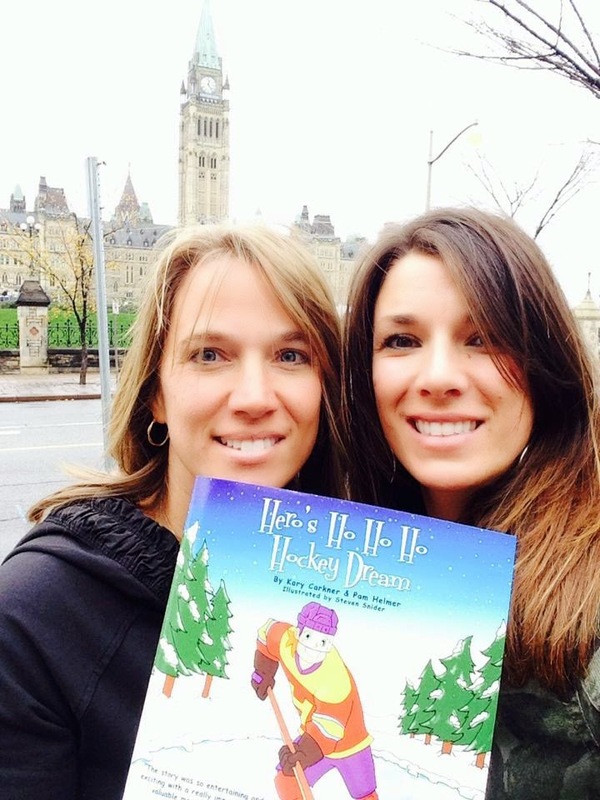 Hero’s Ho Ho Ho Hockey Dream, written by Kary and Pam, and illustrated by another friend of mine, Steven Snider, is a truly remarkable read. With beautifully illustrated images, using a vivid colour selection, Kary and Pam’s story comes to life as the book’s hero, Hero The Hero, learns several valuable lessons on a journey to the North Pole to play on the greatest outdoor rink you’ll ever see. With a forward eloquently written by world-renowned hockey historian Liam Maguire, this book will entertain parents and children of all ages for years to come. In many ways, Hero’s adventure mirrors the journey of Hero’s creators. The new authors are pursuing their passion and following their dreams, just as our young hero does and will do in future books. There have been many triumphs for the Carkner and Helmer families, but like all of us, some defeats too. And it was in tragedy, that Hero emerged and came to be. Inspired to begin writing after the unexpected death of the hero in their life, their father, as well as the heroic resiliency of their mother, Kary and Pam have now embarked on a writing career that will surely flourish and help children of all ages discover the heroes in their family, neighbourhood and in the world around them. When I have interviewed Bryan or Matt here at The Voice of Sport, they have always been very open and honest with their answers, which has allowed me to show a different side to professional hockey; hockey players as dads, as husbands, as fans of the game and as active members of their community. My conversations with Pam and Kary are always filled with laughter (lots of laughter!!) and thankfully, the same openness was present in our first interview together (the first of many!). Having been part of the hockey world for several years and as a stay-at-home dad myself, I can tell you that Pam and Kary are more than stay-at-home moms. They are strong women that have been important contributors to their husbands’ hockey careers, they have been great role models for their children and they are very active in every community in which they have lived. With the schedule for Bryan and Matt sending them out on the road for lengthy periods, there is a lot on their to-do list at times (Bryan is currently an assistant coach with the Hershey Bears after 20-seasons of pro hockey, and Matt is a defenseman with the New York Islanders). So, unlike most households, Pam and Kary have dealt with the added pressure of trades, free agency and injuries over the years, issues that can complicate their lives in an instant. 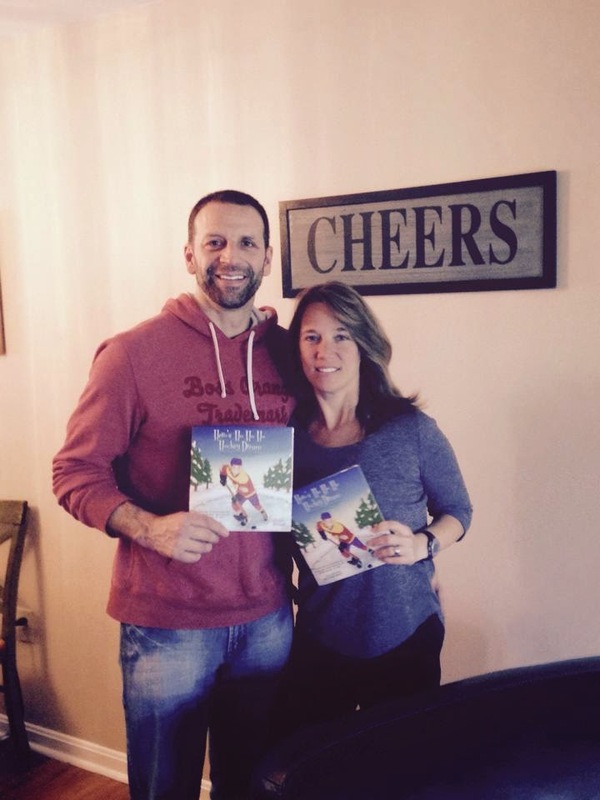 One of the toughest things for moms to do is follow their own dreams, but as they start this new journey of their own, Pam and Kary have lots of support at home. In this part of the conversation, Pam shared something that really struck me about the teamwork that goes into a life in hockey and a life outside of hockey. With countless hours going into writing and creating the book, and now publishing it and making it available (for ordering info, visit herothehero.com), the reaction has been extremely positive. Not only to the story itself and the illustrations, but also the main messages that accompany the book via social media – Twitter, Facebook and Pinterest. There is Hero as a character, someone that kids can be drawn to immediately, but it also allows the conversation to begin about everyday heroes and how to be a better person. Parents and kids can use the book to have conversations about heroes in the family or in their neighbourhood. 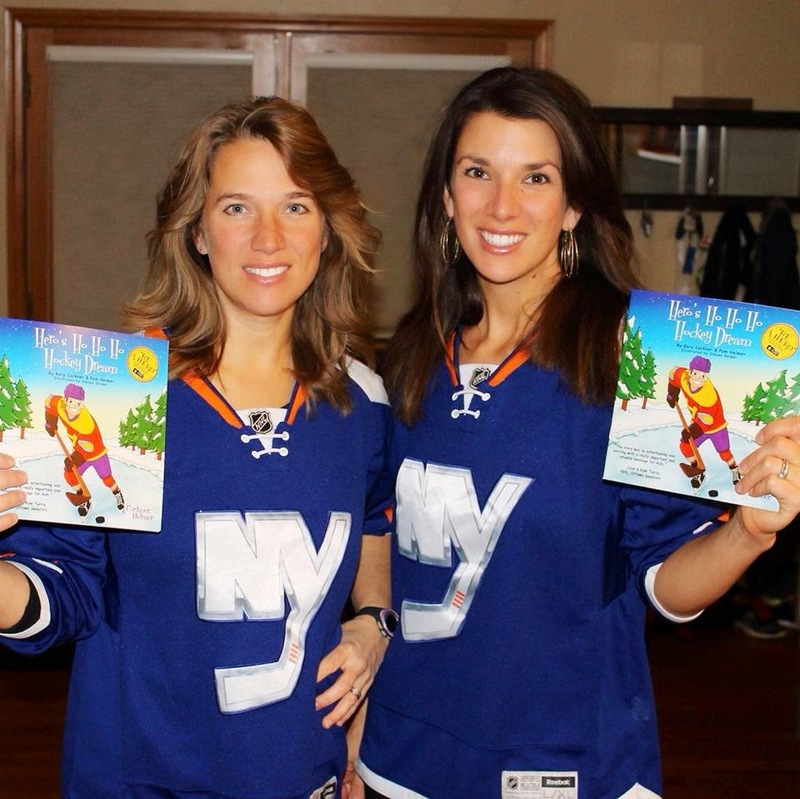 As Pam and Kary prepared for the release of Hero’s Ho Ho Ho Hockey Dream, they also took a crash-course in the world of social media, with a few tips along the way from yours truly. With the world at our fingertips thanks to today’s technology, it was important for the two sisters to reach out and begin building a support system for Hero. As Kary explained, launching a social media component to Hero has made her more aware of how needed Hero’s inspirational messages are in people’s lives. Becoming authors and entrepreneurs (and even songwriters!) 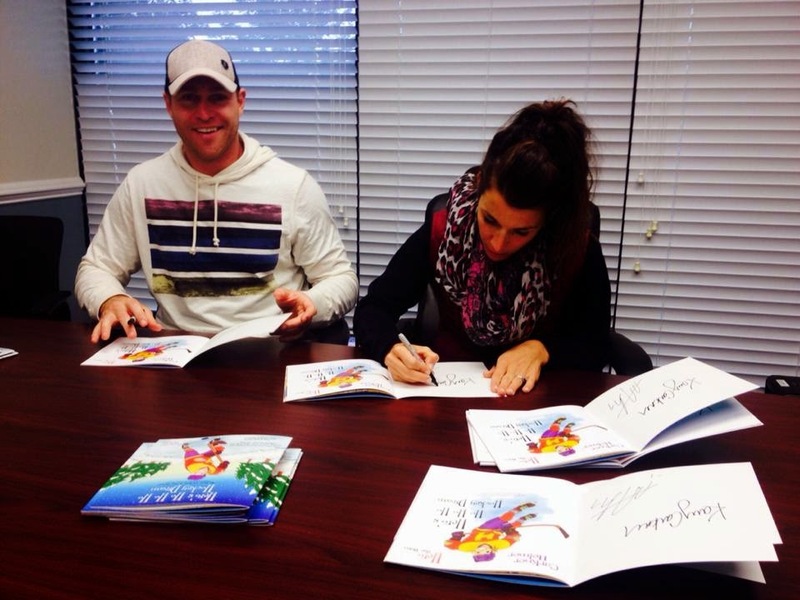 has provided a great teaching moment for Pam’s son Cade and daughter Rylan, as well as Kary’s sons Chase and Corbin. They are seeing firsthand, both from mom and from dad, how love and support, hard work and following your dreams can help you reach new heights. What else can I say here at TVOS about these two wonderful friends, these two wonderful families? As an avid reader, I am truly fortunate to have two more favourite authors and equally fortunate to say that they are friends of mine. Thanks to Kary and Pam, I am able to share my passion for reading and my passion for hockey with my 2-year old daughter Eliza. There is no better gift! Mr. Beliveau was truly one of the greatest Legends the game has ever seen! Winning championships and individual awards can make an athlete great. How they interact with their teammates, friends and fans can make an athlete a legend. Jean Beliveau is at the front of the line when it comes to legendary athletes - from any sport! When you stop to consider for a moment, that Mr. Beliveau retired after the 1970-71 season, he was still one of the most respected and loved players the game has ever seen when he passed away. A truly remarkable man - the hockey world has indeed lost a Legend. 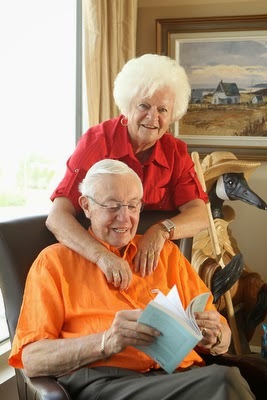 Was looking online for a picture to share and found his 500th goal and one of my favorites found at the Windsor Star's website, relaxing with his wife of 61 years, Elise Beliveau.